Web 2.0 environments provide infrastructure for synchronous access to communication and shared dynamic mathematical tools. These tools enable mathematicians (Alagie & Alagie, 2013) and mathematics learners (Alqahtani & Powell, in press; Powell, 2014; Stahl, 2015) alike to collaborate online to discuss mathematical ideas and solve mathematics problems. However, scant literature in mathematics education examines how with Web 2.0 tools, learners can coordinate both content and social resources as they discuss their mathematical ideas and problem solve. This case study aimed to understand how small teams of learners exchange individual and build group knowledge using mathematical, tool-enabled, and collaborative resources. From a cultural historical perspective (Vygotsky, 1978), we view mathematics as a dialogic experience of noticing, making sense, and wondering (Powell, 2016; Ray, 2013) about objects, relations among objects, and dynamics linking relations (Gattegno, 1987). We use the notion of group cognition (Stahl, 2006) and socially emergent cognition (Powell, 2006) to observe small teams of learners jointly building their mathematical knowledge. 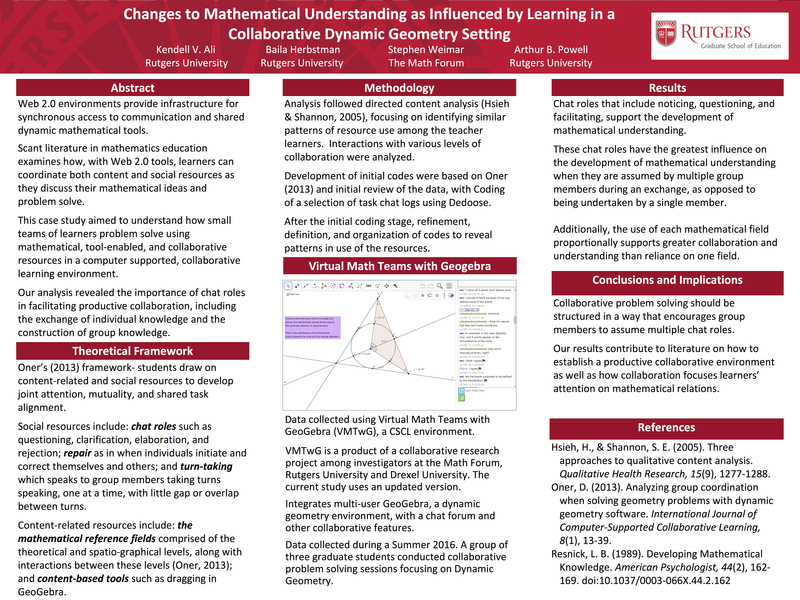 The data for our analysis come from two sources: dynamic geometrical tasks (Powell & Alqahtani, 2015) and, based on work on these tasks, logged, online interactions of small teams of learners interacting to construct geometric figures and solve geometric problems. The learners are secondary teachers at various stages of service. The online interactive system in which they worked on the tasks is a computer supported, collaborative learning environment, Virtual Math Teams (VMT) (Stahl, 2009). It contains facility for exchanging textual chat as well as for creating, manipulating, and sharing mathematical objects through a multiuser version of GeoGebra. The logged interactions are available for review through a replayer. We used these logs to employ a methodological approach, developed by Oner (2013) based on conversation analysis, for studying coordination of resources when solving geometry problems with dynamic geometry software. It captures both the content-related and social discourse within the context of geometry problem solving using dynamic geometry software. The coordinated resources that we analyzed involved mathematical and tool-enabled recourses and collaborative resources. Focusing on a case of one team of teachers, our analysis found that their discursive and inscriptive interactions involved the use of collaborative and mathematical and tool-enabled resources of the VMT environment. These interactions revealed recursive movement between spatio-graphical and theoretical geometry knowledge of the teachers, as well as the theoretical feedback provided by the VMT environment. We also found that that they discursively extended their mathematical knowledge and moved from remembering to understanding (Hewitt, 1999, 2001) in the sense that what they knew as fact became knowledge grounded in understanding of relations. The results of our case study informs research about how collaborative teams of teacher learners coordinate content and social resources within a virtual environment as they discuss mathematical ideas and solve mathematical problems. It further contributes to literature on how to establish a productive collaborative environment as well as how collaboration focuses learners’ attention on mathematical relations among objects, and shapes knowledge-building.